Jean-Michel SAIVE of Belgium plays at the QOROS 2015 World Table Tennis Championships his 24th World Championships in Suzhou. His first was back in 1983 as a 13 year old. Now, 32 years later, he is still in good shape, hungry for game. SAIVE is currently ranked at the position no. 130. He will have unique role this summer. 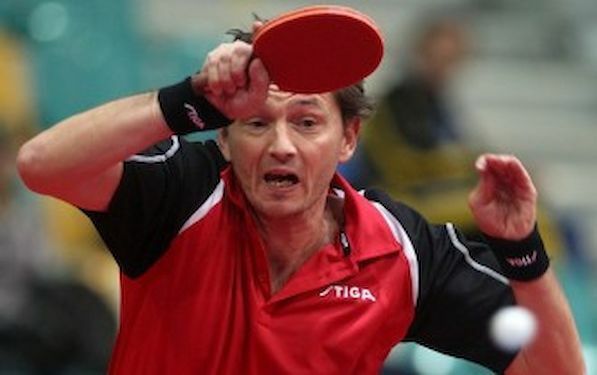 SAIVE is qualified for the first European Games to be held in Baku in June and Jean Michel who is also a member of the International Table Tennis Federation Athletes Committee, is the President of the European Olympic Athletes Commission. “I will be all over the Baku this summer. It is going to be strange to be in the suite one day, then to attend the Opening ceremony and then to change for the jersey and play on the field. But I will certainly enjoy the moment”, said the player who has competed in every Olympic Games since table tennis was introduced in 1988. In Belgium’s team are also Cedric NUYTINCK and Robin DEVOS.